The wrapper is clean with no large veins. No box press. Every band is perfect. 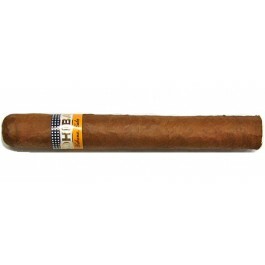 The Cohiba Siglo II is no exception. The wrapper is somewhat dark, about the average shade for these Cigars with a well applied triple cap. The flavor profile so early on is more medium to full then light to medium. If you're someone who likes the old school flavors of the Bolivar's and the Partagas's, then you will enjoy the fuller than usual flavor profile of this Cohiba. The flavor profile of the Siglo II however stays steady to the profile of the first third with hints of honey and leather. Boy this is good. This is very good. We start to pick up some grassy notes that's not a bad thing. It's getting to the end of the Siglo in the final third but the cigar is still smoking exceptionally well. Naturally towards the end of the Cigar the strength starts to intensify and this one is no different. The Cohiba Siglo II is an outstanding smoke! In summary, one needs to let the Siglo II go when your fingertips start to burn and you can't hold on to it anymore.